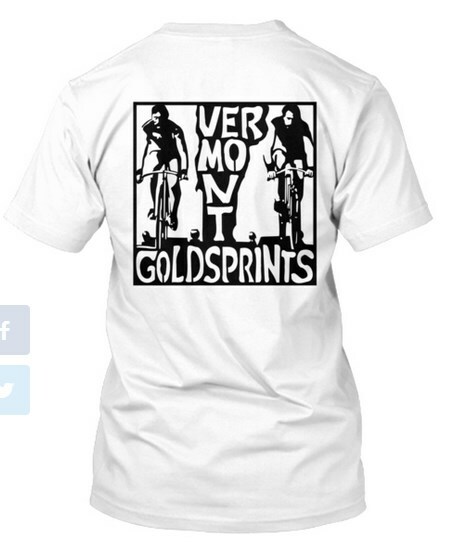 Vermont Goldsprints Tee Shirts are on Sale NOW! Just $10! The front of the shirt. Expect to be mistaken for a scrappy local pretending to be an exchange student from Italy. You ride bikes. You love to ride bikes. Sometimes you even ride bikes when it's really cold and snowy out, and sometimes when it's really cold and snowy out, you ride bikes on rollers indoors, or maybe you beat up on your friends at Mad Dashes or another Vermont Goldsprints event. Anyway, you do this enough that you want to tell your friends about it by wearing this t-shirt. Back of the shirt- the Vermont Goldsprints logo in all its glory. On the front, the word "ROLLERS" in a basic font. The kind of font your mom would get put on a shirt she made up for you and your high school buddies as you prepared to race the college boys and give 'em what they deserve for intruding on your local swimming hole. Also perfect for replacing your ripped up clothes from that time the guy from Cinzano put a stick in your spokes. I could go on, but for heaven's sake if you don't know what I'm talking about, go watch Breaking Away already! On the back, it's the Vermont trifecta- Hippie fonts, mustaches, bikes. How could you go wrong? These shirts are available through Teespring, which is sort of like a Kickstarter for T shirts. You set a minimum order number, and if enough shirts are ordered to make that number, your card is charged, your shirt is printed, and away we go. The "Campaign" for these runs through August 14, and I only need about 40 shirts to be ordered for this to be a "go." I have set the price for the basic tee at $9.99, of which I will receive exactly one penny if the shirt sells. If you are local, you can pay $0.00 for shipping and pick up your shirt from me, otherwise shipping is something like four bucks. You have until August 14th to make a decision. Choose wisely. Teespring's a bust, long live tee shirts!